Taking advantage of the unique properties of zinc oxide nanowires, researchers have demonstrated a new type of piezoelectric resistive switching device in which the write-read access of memory cells is controlled by electromechanical modulation. Operating on flexible substrates, arrays of these devices could provide a new way to interface the mechanical actions of the biological world to conventional electronic circuitry. The piezoelectrically modulated resistive memory (PRM) devices take advantage of the fact that the resistance of piezoelectric semiconducting materials such as zinc oxide (ZnO) can be controlled through the application of strain from a mechanical action. The change in resistance can be detected electronically, providing a simple way to obtain an electronic signal from a mechanical action. The research was reported online June 22 in the journal Nano Letters. The work was sponsored by the Defense Advanced Research Projects Agency (DARPA), the National Science Foundation (NSF), the U.S. Air Force and the U.S. Department of Energy. In conventional transistors, the flow of current between a source and a drain is controlled by a gate voltage applied to the device. That gate voltage determines whether the device is on or off. The piezotronic memory devices developed by Wang and graduate student Wenzhuo Wu take advantage of the fact that piezoelectric materials like zinc oxide produce a charge potential when they are mechanically deformed or otherwise put under strain. These PRM devices use the piezoelectric charge created by the deformation to control the current flowing through the zinc oxide nanowires that are at the heart of the devices – the basic principle of piezotronics. The charge creates polarity in the nanowires – and increases the electrical resistance much like gate voltage in a conventional transistor. The mechanical strain could come from mechanical activities as diverse as signing a name with a pen, the motion of an actuator on a nanorobot, or biological activities of the human body such as a heart beating. The piezotronic switching affects current flowing in just one direction, depending whether the strain is tensile or compressive. That means the memory stored in the piezotronic devices has both a sign and a magnitude. The information in this memory can be read, processed and stored through conventional electronic means. Taking advantage of large-scale fabrication techniques for zinc oxide nanowire arrays, the Georgia Tech researchers have built non-volatile resistive switching memories for use as a storage medium. They have shown that these piezotronic devices can be written, that information can be read from them, and that they can be erased for re-use. About 20 of the arrays have been built so far for testing. The zinc oxide nanowires, which are about 500 nanometers in diameter and about 50 microns long, are produced with a physical vapor deposition process that uses a high-temperature furnace. The resulting structures are then treated with oxygen plasma to reduce the number of crystalline defects – which helps to control their conductivity. The arrays are then transferred to a flexible substrate. 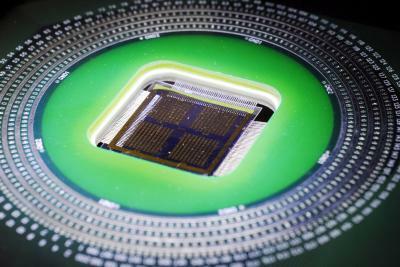 The piezotronic memory cells operate at low frequencies, which are appropriate for the kind of biologically-generated signals they will record, Wang said. 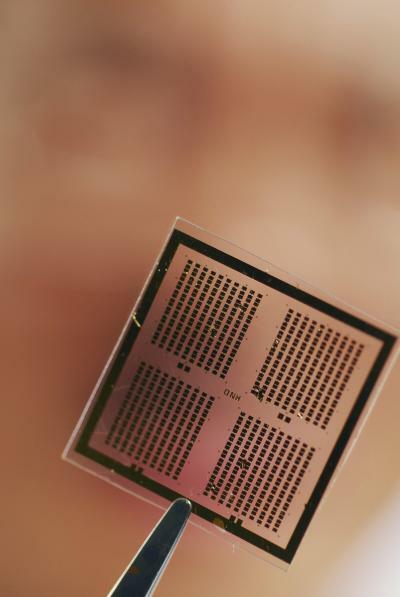 These piezotronic memory elements provide another component needed for fabricating complete self-powered nanoelectromechanical systems (NEMS) on a single chip. 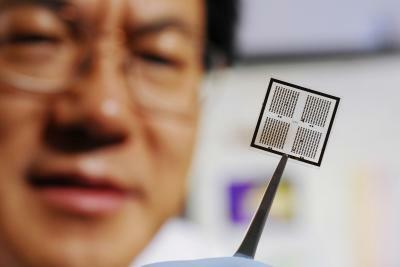 Wang’s research team has already demonstrated other key elements such as nanogenerators, sensors and wireless transmitters. Wang believes this new memory will become increasingly important as devices become more closely connected to individual human activities. The ability to build these devices on flexible substrates means they can be used in the body – and with other electronic devices now being built on materials that are not traditional silicon.